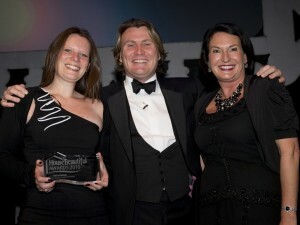 Home - Anglian Win Award!!! Anglian Home Improvements won Best Garden Product or Range in this years House Beautiful awards, for our Conservatory Verandah. This brilliant new design has been hailed the saviour of British summer time with its unique roof structure, which overhangs the end of the conservatory, giving you outdoor living under a beautiful glass ceiling. 2010’s best products and home retailers were on fine display for the House Beautiful awards, being held at the Royal Opera House, London. Garden expert David Domoney presented Anglian Home Improvements award to Caroline Mills, Product Manager and Melanie McDonald, Head of Marketing. Well done to everyone who helped create such a unique, genius idea to improve our summer times, and win such a prestiges award. Anglian Home Improvements raising the standards since 1966. For more information on our Conservatory Veranda click here.